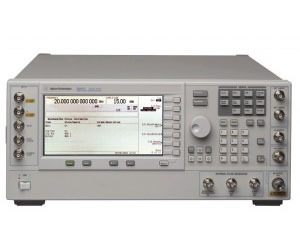 The Agilent E8267C PSG vector signal generator is the first integrated microwave vector signal generator in the industry with direct I/Q modulation up to 20 GHz. It features a built-in wideband I/Q modulator that delivers up to 1 GHz RF modulation bandwidth and an advanced wideband (80 MHz) internal baseband generator capable of flexible arbitrary waveform playback and sophisticated real-time signal generation. Clearly this groundbreaking integrated functionality, only available in the E8267C PSG, drastically simplifies the generation of complex vector modulated signals for design and manufacturing test applications in aerospace, defense, satellite communications, and broadband wireless. Just imagine, convenient access to the most complete set of calibrated wideband test stimuli ranging from digital and analog baseband to RF and microwave carrier frequencies. Customize the PSG for baseband, RF, and microwave test applications ranging from simple distortion test and general purpose troubleshooting to baseband coding algorithm development and advanced digital microwave transceiver design verification. A variety of optional performance enhancements and accessories are available and complemented by a comprehensive suite of signal creation software. Its modular architecture makes it easy to configure the PSG to meet your specific test requirements, providing the level of performance and signal creation capability you need today and the option to upgrade in the future.